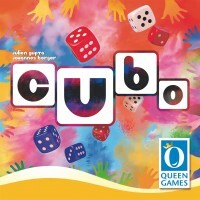 Cubo is a fast paced dice rolling game played in 6 rounds with all players rolling simultaneously. The game is for 2 to 4 players ages 8 and up and plays in 20-30 min. And what about those colors??? The colors and pallet of Cubo are inspired by the Holi Festival of Colors, Happiness and Peace. This festival celebrates a wonderful message and ties in very nicely with the social and friendly event of boardgaming. Cubo has a real-time mechanic that is brought forth not with a timer, but rather a limited resource - the four dice in the center. Gain as many points as possible with your nine dice by composing Straights and Trips. Add a Review for "Cubo"